Hillsborough, NC, December 21, 2016	(Newswire.com) - ProPatient, a provider of interactive online patient education tools is teaming up with Project Inform, a health education and health care access organization, to develop a unique and interactive online resource which helps to inform people managing HIV. HIV stands for human immunodeficiency virus. If left untreated, HIV can lead to the disease AIDS (acquired immunodeficiency syndrome). HIV attacks the body’s immune system, specifically the CD4 cells (T cells), which help the immune system fight off infections. If left untreated, HIV reduces the number of CD4 cells (T cells) in the body, making the person more likely to get infections or infection-related cancers. Over time, HIV can destroy so many of the cells that the body can’t fight off infections and disease. No effective cure for HIV currently exists, but with proper treatment and medical care, HIV can be controlled. 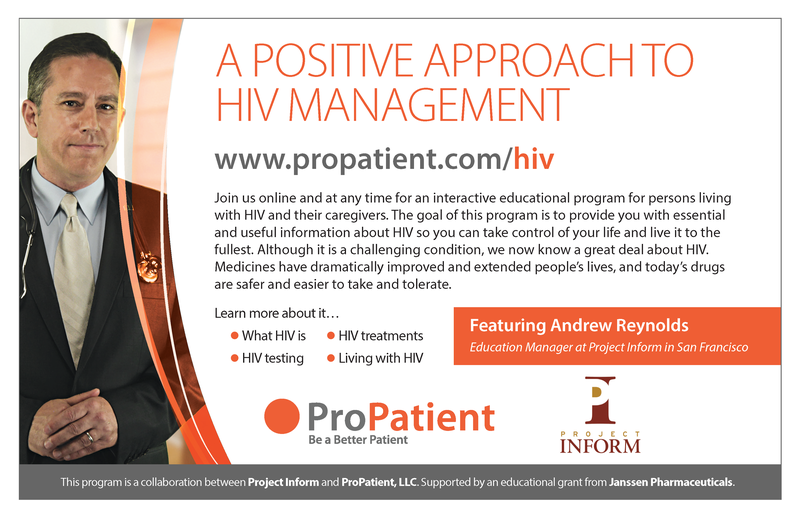 The program entitled, “A Positive Approach To HIV Management,” is an interactive educational module for persons living with HIV and their caregivers. It provides essential and useful information about HIV, testing, HIV treatments, and how to manage social situations.